In my hand is a torque wrench. Nothing unusual in that. They aren’t exactly rare in the bike industry. This one, however, is more than a little bit special. 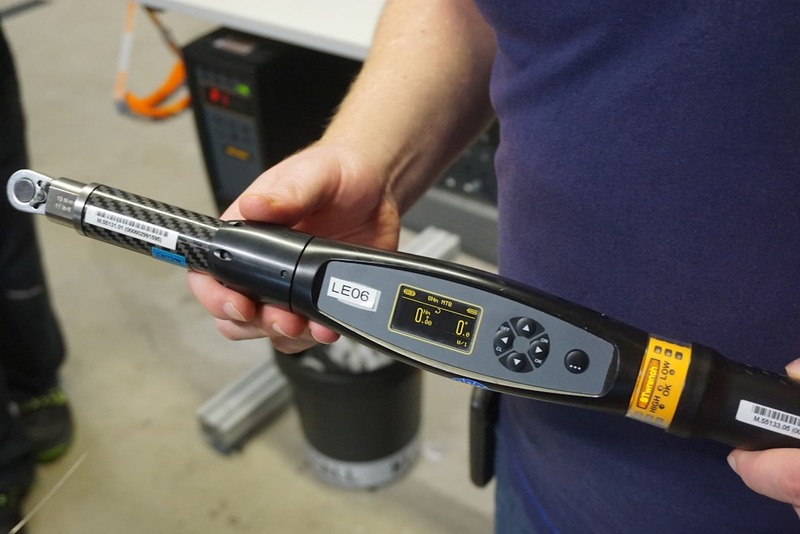 The small digital gauge on the shaft is the only real giveaway. Well that and my genial host for the visit, Thorsten, Global Communications Manager with Canyon, informing me that what I have in my hands is 12,000 Euros worth of torque wrench. Yup. You read that correctly. Twelve THOUSAND Euros. Somewhat dropped of jaw, I rather gingerly hand it back while trying not to explete WTF. “Put the torque wrench down, Sanny and walk away slowly!! 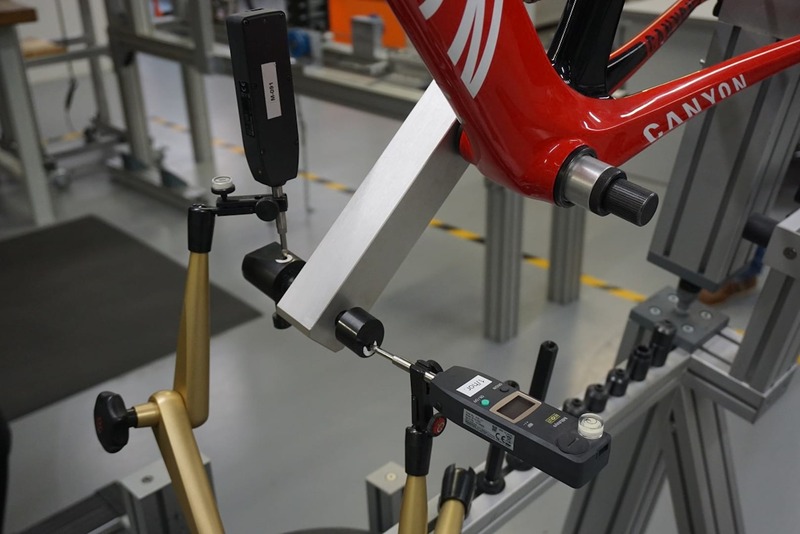 What makes this particular tool so special is that it is tied into a production and logistics system that can track down who worked on a specific bike, which bolts they tightened and the Newton metre setting they set it to. In terms of manufacturing, this is aircraft industry levels of control. It is my introduction to the world of Canyon bikes and German Engineering and suffice to say, I’m impressed. You know all those stereotypes about German manufacturing, the attention to detail and focus on quality? Turns out they are all true as my visit to Canyon in their home town of Koblenz, North West of Frankfurt sets out to prove. 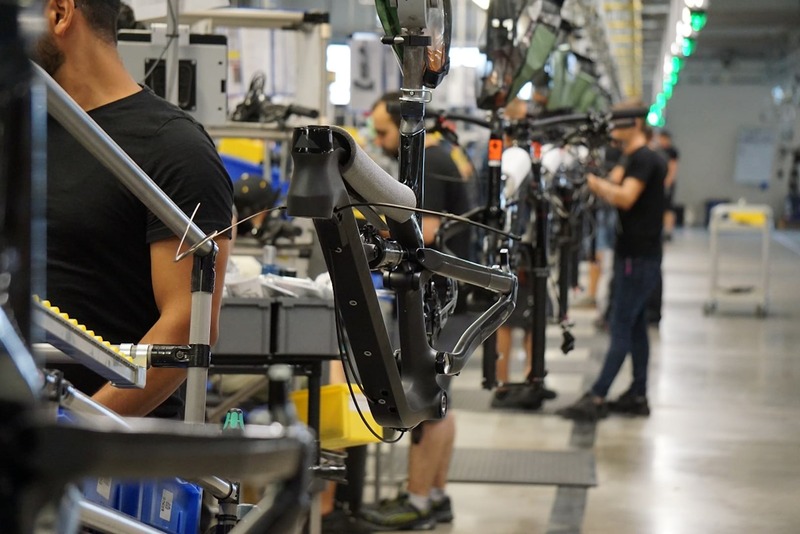 Invited over to meet the team behind the development and design of Canyon’s new 100mm full suspension race bike, the LUX, I’m being treated to a behind the scenes tour of Canyon’s production and warehouse facility located near the confluence of the Mosul and Rhine rivers. As factories go, it is as far removed from the many UK manufacturers that I used to work with in a previous life. Donning my safety overshoes, I am guided around the facility by Thorsten and his colleague Johannes who are able to answer my many questions and comments despite the fact that my version of English (Glaswegian Scottish) isn’t the easiest to understand. Thorsten, a most excellent host. Like Charlie entering Willy Wonka’s factory, I am eager to see what lies through the next door and the door after that. First off, I am taken through the assembly line. 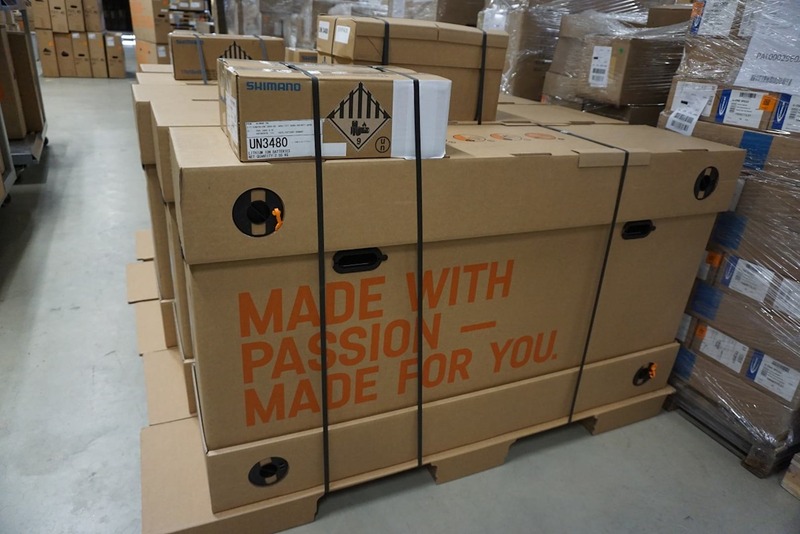 It is here that each Canyon bike is assembled and checked before it is boxed up, ready to ship to the customer. Clean, calm and efficient would be adjectives best suited to describe what I see. An automated line above our heads carries each frame past a line of operatives who go about assembling each bike. One attaches the gear cables, another the disc brakes, yet another the bars and stem and so on. Every part of the build is broken down into a simple process where hands and tools flash in front of me with practiced ease. On average, each task is given 75 seconds to complete. “What if they need more time?” I ask. Thorsten and Johannes smile and point to a black ball on a cord at each workstation. “They pull that and it gives them an extra 10 seconds every time they pull it”. Scanning around the line, I don’t imagine it gets pulled very often. 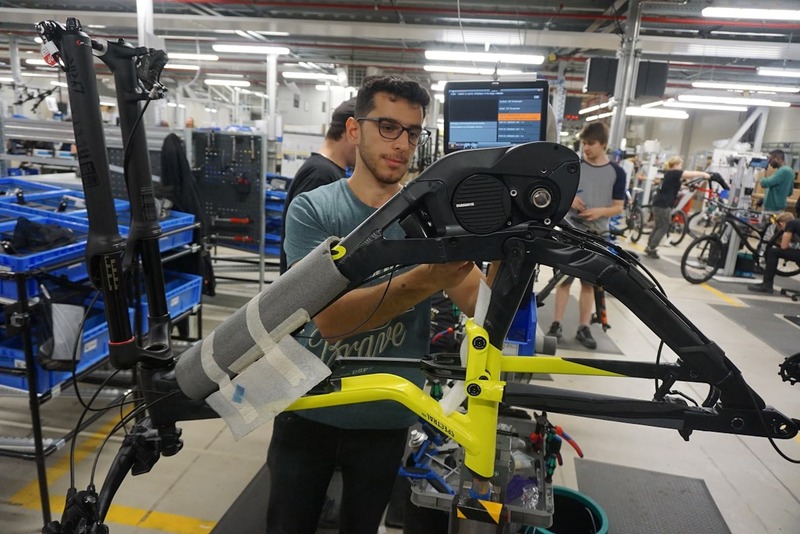 Once each bike is assembled, it moves along to a group of operatives who are responsible for doing the pre-delivery checks and ensuring that all bolts are torqued up to the correct settings. It is here that my new favourite tool is employed. I briefly contemplate how I really NEED one but suspect that the long haired Finance Director (aka my good lady the Professor her indoors) would veto the purchase in fairly direct and unequivocal terms! Aircraft industry levels of process and control are what Canyon consider sets them aside from the rest of the industry. With no dealer to act as an intermediary, all their bikes are set up to be ready to ride out of the box. Fit the wheels, set the bars and saddle and you are good to go. With no intermediary to do the likes of pre delivery inspection, Canyon enjoy a direct relationship with each and every customer. Making bike building look effortless. German engineering and Far Eastern manufacturing skills in harmony. “So why do you assemble your bikes here in Germany when you could do so at one of your five or six production partners in the Far East?” I ask. “Economically, it of course doesn’t make sense to assemble here in Germany. Fortunately, we do not think like accountants. Our people are important to us. We employ some 800 people here in Koblenz. We are a big local employer and our ethos reflects that of our founder, Roman Arnold. Taking the lead from his father who sold bike parts imported from Italy from a trailer while Roman was racing, Roman adopted a Direct-2-Consumer model from day 1. Once a Finance Director, always a Finance Director and my mind is in accounting overdrive. 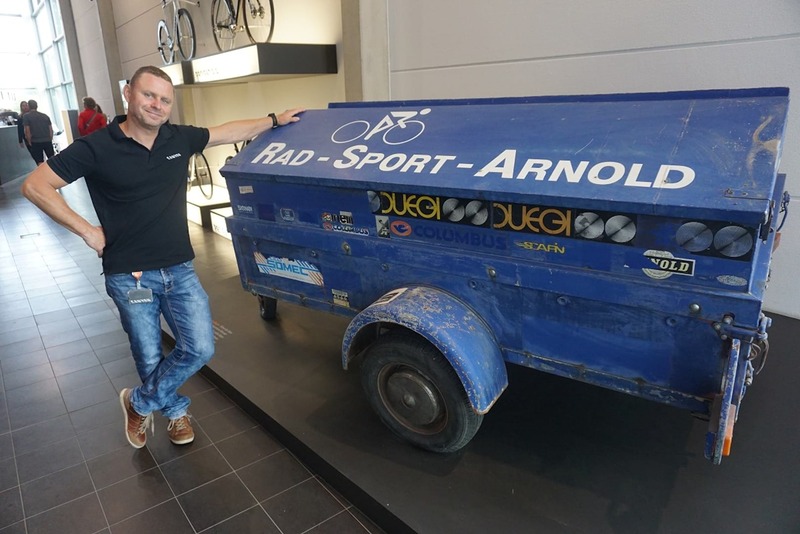 In barely the blink of an eye, Thorsten and Johannes reel off the average value of bikes and parts held before arriving at the not inconsiderable sum of 50 million euros. Blimey! Some lucky rider’s soon to be new bike. My mind is now racing. How do you control stock? How do you manage production during those months of the year when demand isn’t at peak? How do you actually find all the parts you have stored on site? My hosts give me a knowing smile and walk me into the parts storage area and finished bikes area. It’s like walking into the enormous warehouse at the end of “Raiders of the Lost Ark”. With row upon row of bike boxes stacked many metres high, it’s not difficult to imagine the Lost Ark of the Covenant being stored here…albeit in a bike box…and able to be located in a matter of seconds. No gathering dust in a hidden corner of a long forgotten warehouse here! As you would probably now expect, the entire building is set up so that every single frame and part down to pretty much a single Allen bolt can be located quickly and easily. More computing power than was in the Lunar Lander! 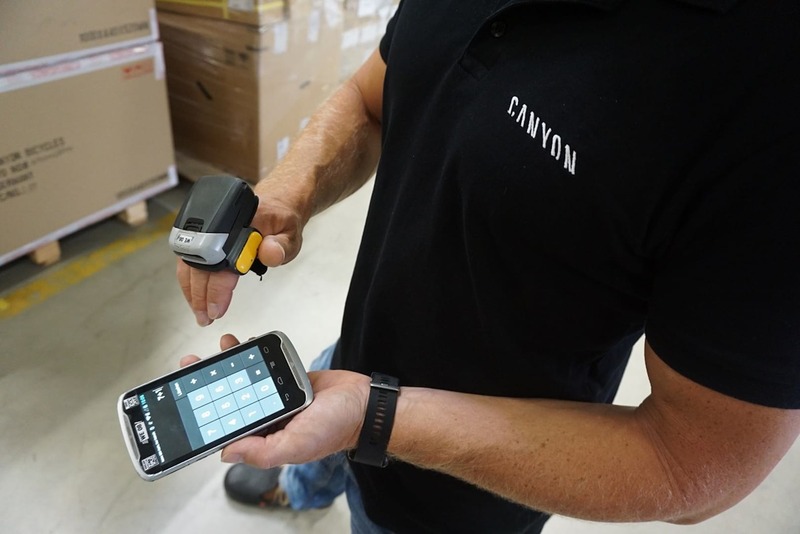 Using a hand mounted scanner and wrist mounted smart phone device that wouldn’t be out of place in Q Branch, there is no hunting around in boxes and parts bins in the general location of where things are meant to be. The tech takes all the guess work out to the extent that if the operators want to call up an image of the item they are looking for, they can. Now I don’t know about you but even for a gear geek like me, it can be pretty hard to distinguish one cassette from another at times. 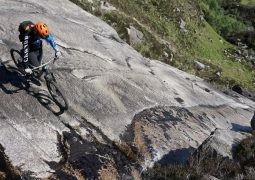 Canyon’s process and system engineers recognise this and have taken out all of the guesswork. 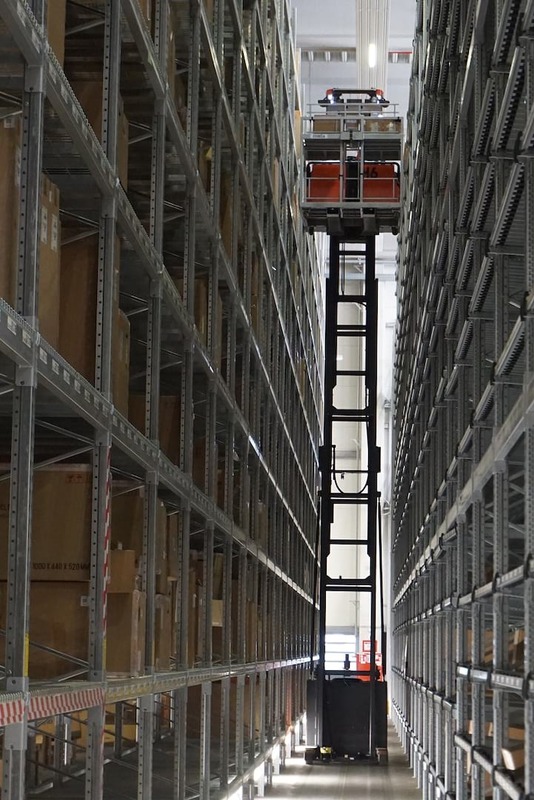 With boxes stacked many metres high, my next question as to how you get them up there and back down again is answered before I can even ask it. Rolling into view is a mobile platform being operated by one of Thorsten’s colleagues who offers me a ride in one. Shooting up into the air then moving backwards is slightly unnerving at first but damn, it is cool. I have absolutely no need for one but I cannot help but want one. Santa’s elves better get working early this year! Moving upstairs, I get to see where the assembly process is perfected. Different bikes require different solutions. Take internal cabling as an example. As someone who has tried this themselves at home, this can be a royal pain in the neck. 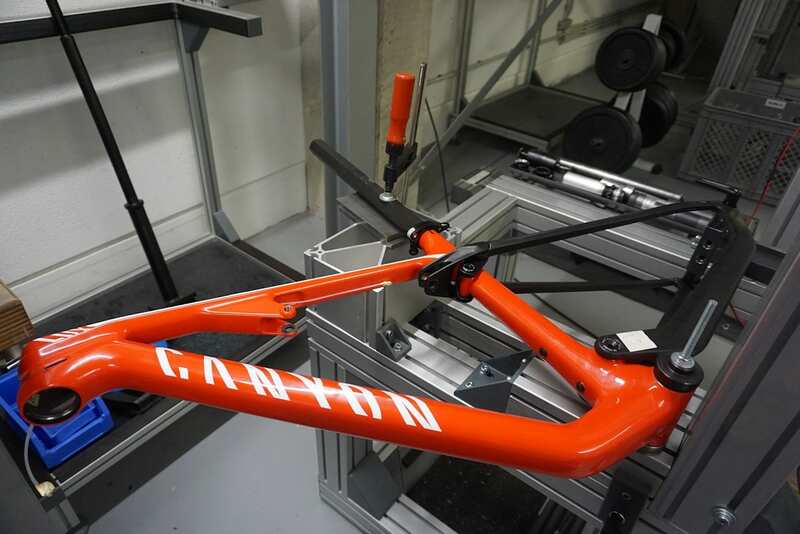 At Canyon, design features like internal routing guides are built in from the start with a view to ease of assembly. 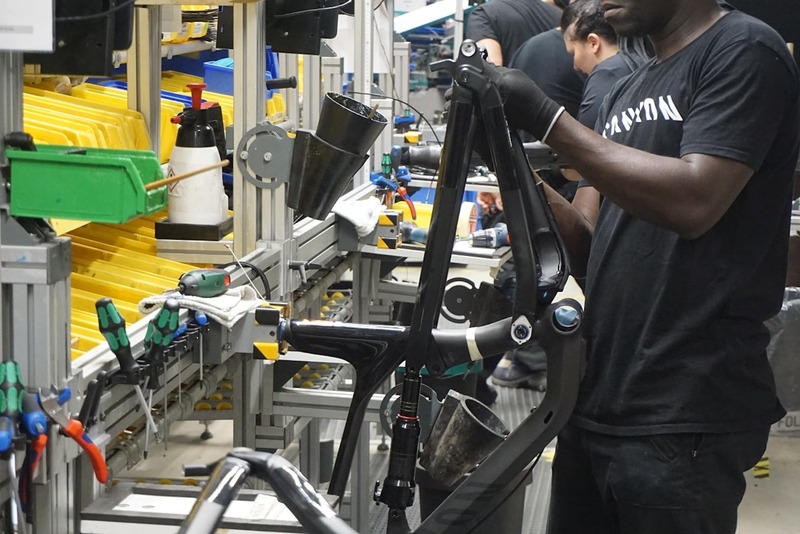 In one corner, I see the team working on Canyon’s time trial bike, the Speedmax. It looks pretty complicated stuff as I watch the team install the integrated aero brake callipers. The Speedmax is the only model that isn’t assembled on the standard production line. On average, Thorsten informs me, each trained and experienced mechanic will build around 14 of these bikes each day. Admit it. Like me, you have more than a little workshop jealousy! 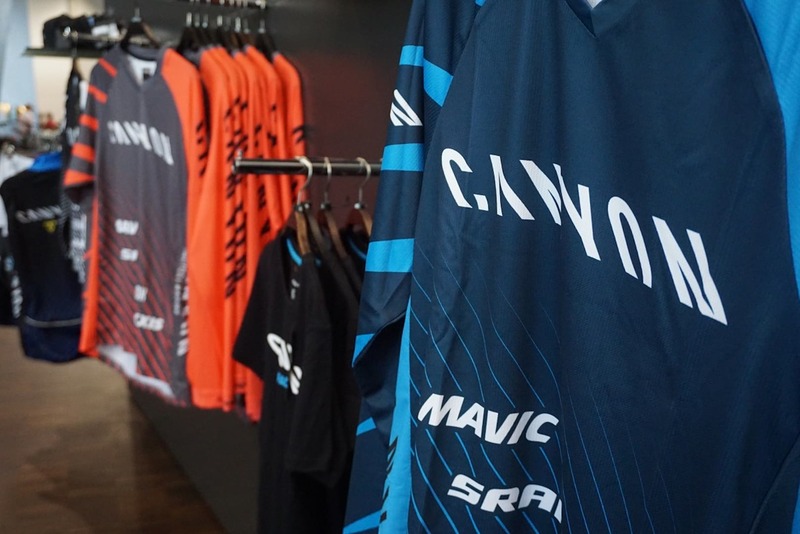 When Canyon opened this facility, they came under a lot of criticism as delivery dates were missed as they worked to iron out the challenges that a new location coupled with system changes brings. It is something that they have worked hard to learn from and Thorsten tackles it head on. “The customer is at the very heart of what we do. Like them, we are all cyclists and appreciate that time off your bike is never good, whether as a potential customer awaiting a delivery or an existing customer. When people buy a bike from us, our aim is to be customer centric and to put their needs first. Currently, we are working on building relationships with bricks and mortar shops as we seek to work with service partners. This will complement but never replace our direct-to-consumer approach. 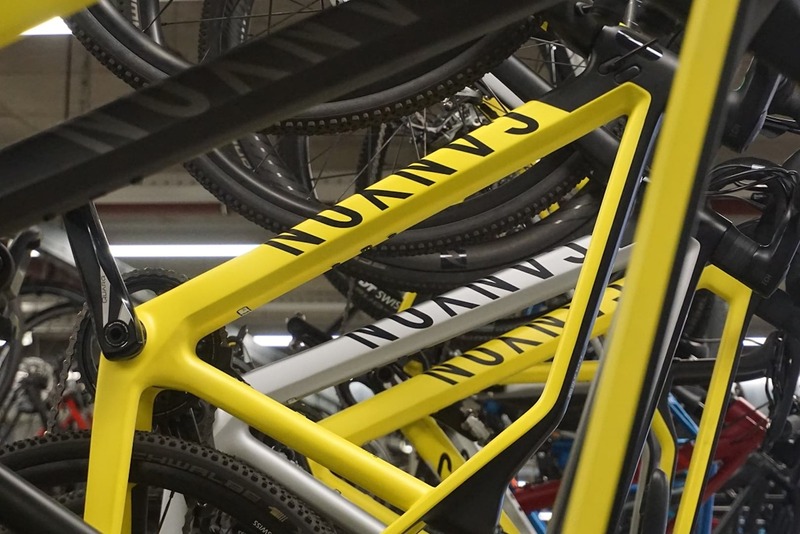 At Canyon Home (a few kilometres down the road from the factory); customers can come in and view our entire range of bikes. If they want to test ride a bike, we have a fleet of bikes in all sizes available for them to do so. Just pick which colour and size you would like to try. For our online customers, if they have a problem with one of our bikes, they have several options open to them. Firstly, they can call and chat to us on the phone, e mail us, talk via chat on the website which is the most popular method of contact or contact us via social media. For the easier maintenance procedures, we have a series of online tutorial videos available. If we cannot resolve the issue there, our standard procedure is that we will arrange for the bike to be sent back to us and we cover the shipping costs. We encourage our customers to keep their bikeguard box that their bike is delivered in as this means they don’t have to source another bike box in the event of an issue. On the shop floor where effortless calm pervades. I take a moment to reflect on this. 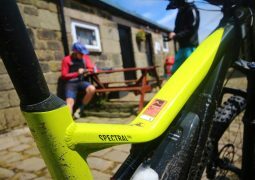 One of the greatest barriers to buying a bike online is that reviews, geometry charts and specification lists can only tell you so much. Only by swinging your leg over a bike and taking it for a spin can you tell if it is the bike for you. Canyon clearly recognise this and have developed what they consider to be a customer friendly approach to dealing with it. A Canyon Home we will a-go! Leaving our safety footwear behind, we hop in the car for a short drive to Canyon Home. 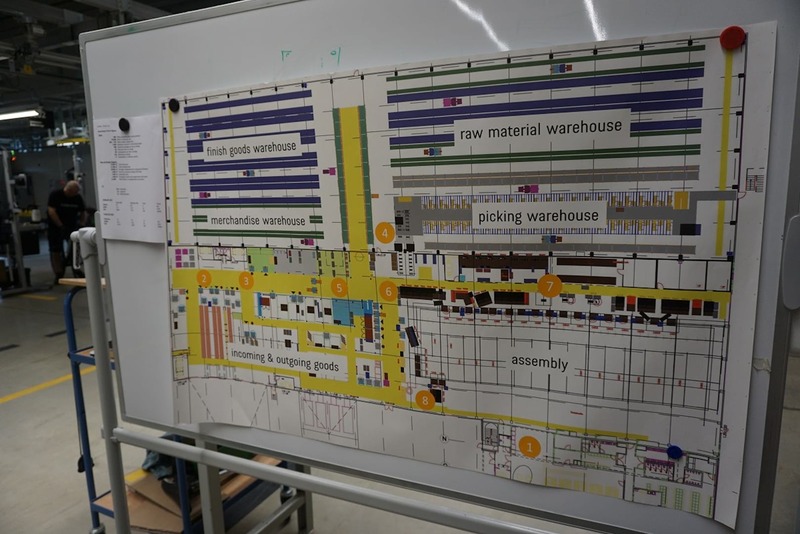 Although assembly is now taken care of at Canyon Factory, Canyon Home remains at the very heart of the company. Service Centre, R&D testing hub, public face where customers can come and test ride a bike, café, museum – it is all these things and more. Time to satisfy the consumer monkey. At the main entrance is a section devoted to the history of the brand from the small trailer that Roman Arnold’s father used to sell the parts he imported from Italy through to the likes of Nairo Quintana’s race winning road bike and Patrick Lange’s World Champion Speedmax which helped him win Ironman Kona 2017. 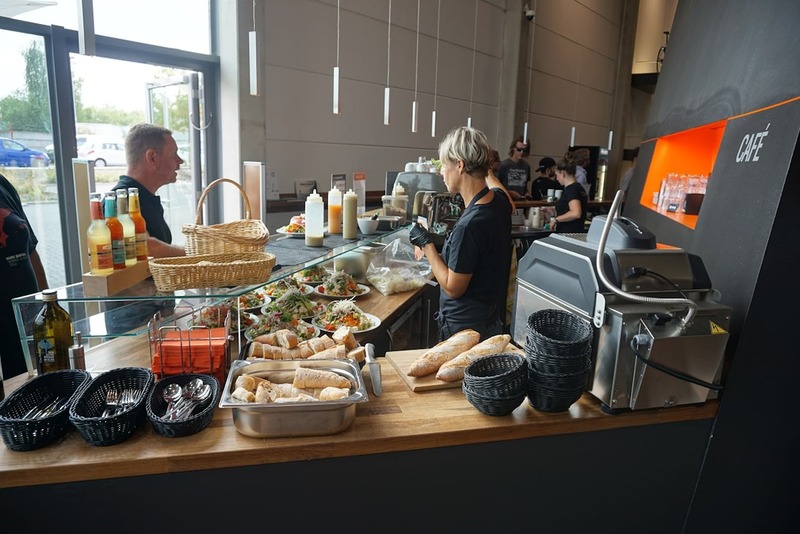 It is also home to a particularly fine café serving wares such as the curiously named Fritz Cola and some top notch cakes. But before that, there is more stuff to see…..
Nom! Nom! Nom!……Quite possibly Sanny’s favourite part of Canyon Home! Tucked away in a corner of Canyon Home is what I reckon is the really cool stuff. 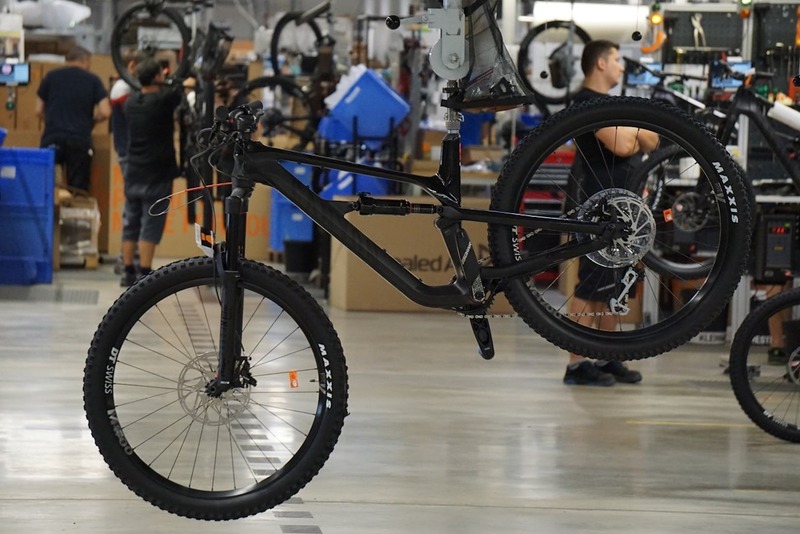 In the research and testing labs, there are all manner of contraptions and machines whose jobs are to design, develop, build, test and destroy frames and parts long before they are released to the buying public. I’m shown round by two of Thorsten’s colleagues and as you would by now expect, their English is impeccable. Only one item is off limits – a prototype frame that is kept under cover from the eyes of a prying journalist. However, everything else is fair game. Static load testing – Canyon style. 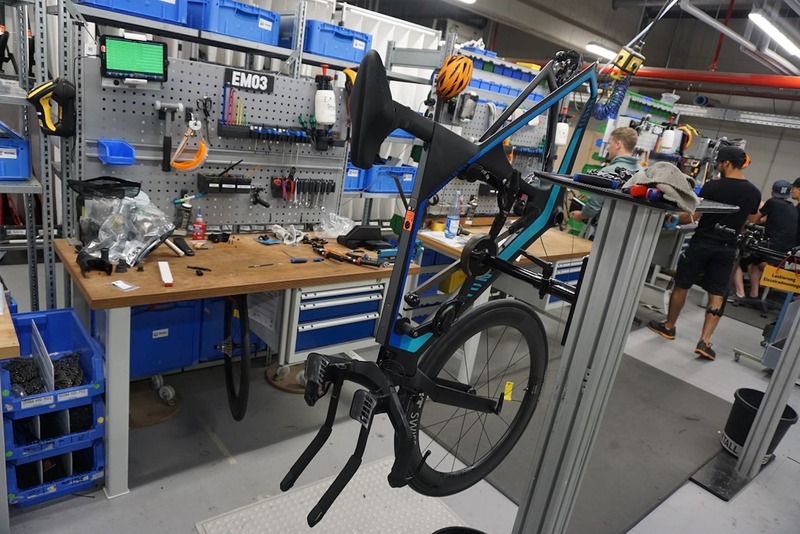 From static load testing kits through to what I can only describe as bike torturing machines safely tucked away inside large Perspex cabinets, pretty much every aspect of a bikes construction is tested and assessed here, primarily as part of the engineering process. Frames and forks flex alarmingly in front of me while bars are bent out of shape repeatedly to mimic real life stress loading. Strangely reminiscent of the droid torture scene in Jedi! Passing by a CNC machine and 3D printer, I am shown to the X ray machine room. 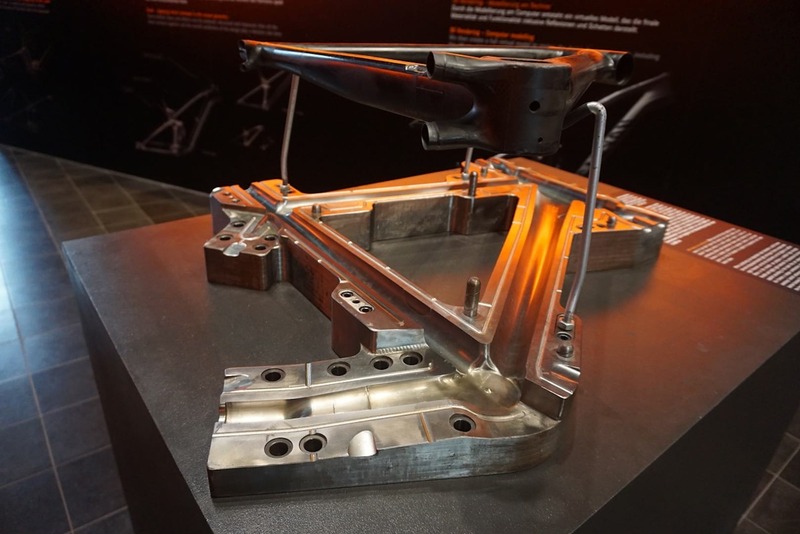 Even for a large company such as Canyon, this is a significant piece of kit to invest in coming in at several hundred thousand Euros and one which Canyon reckon marks them out as unique in the bike industry. 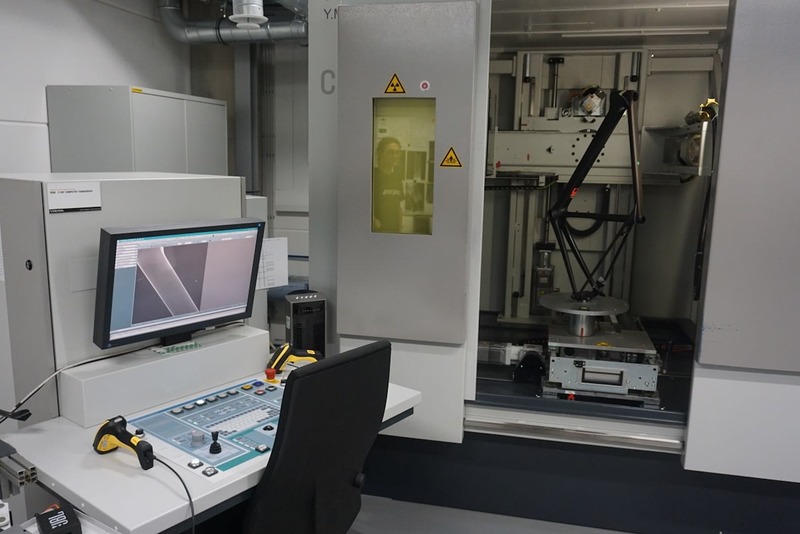 Moreover, every production partner / supplier that Canyon works with in Asia is required by them to have and use the same X ray / CT machines for testing. 3D X Ray machinery with added ghostly figure! 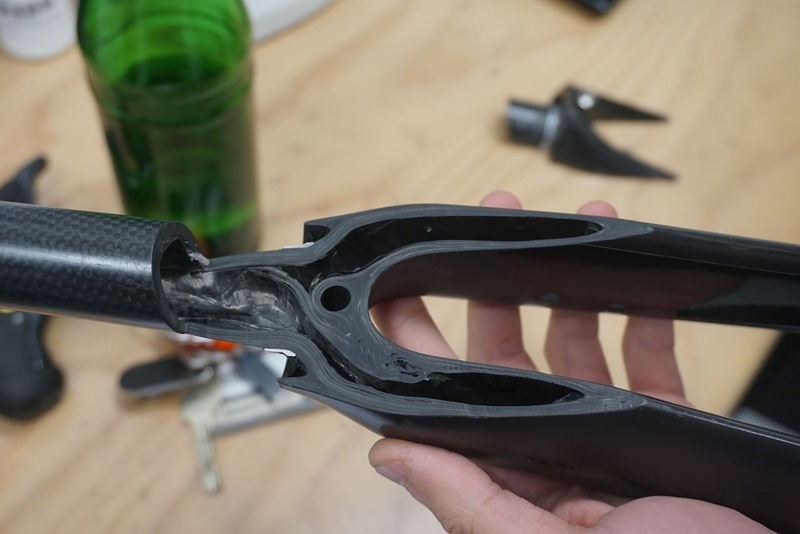 One of the challenges which come when building frames and parts from carbon is that visual inspection checks can never give an accurate picture of the quality of construction. Variations in wall thickness and areas of delamination can only be reliably picked up when you start employing x ray technology. On one of the walls, there are a series of images of defects in carbon parts that a visual inspection would never pick up. I make a mental note to myself never to use a carbon part that hasn’t been subjected to this level of scrutiny. Reading a post on an internet forum from a user who bought a cheap carbon frame or component and has never had any problems isn’t the level of reassurance I’ll be looking for in future. Test your engineering chops. How many problems can you spot? 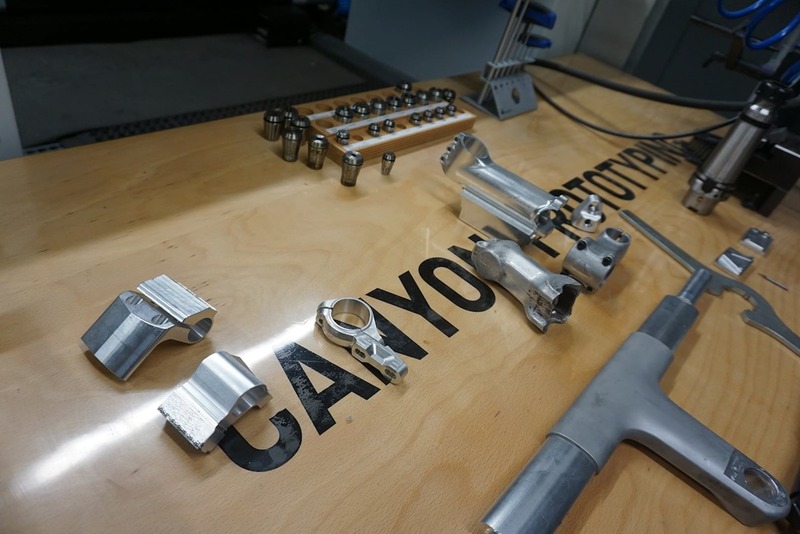 When I ask what percentage of Canyon Engineered Parts engineered parts are tested, I am met with a frankly jaw dropping 100%, whether in house or by one of Canyon’s trusted suppliers who are based in the Far East. For parts sourced from there, additional random checks are conducted on 10% of those coming into the factory after 100% checking of the first few batches. From a quality control perspective, it is more than a little impressive to my eyes. 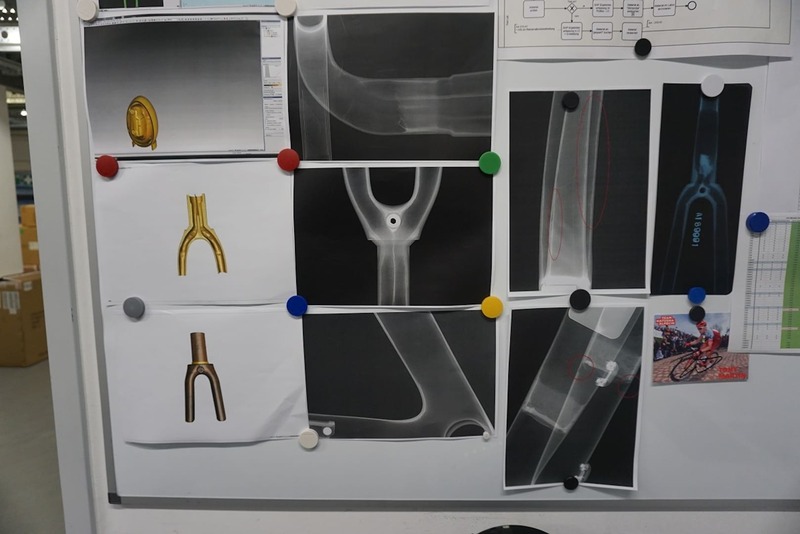 Thorsten informs me that the focus of testing is on carbon forks, cockpits, stems and handlebars as the risk of being badly injured associated with the front of a bike failing is considered to be far higher than failure elsewhere. They even have dedicated prototype tables! Now at this point I’m sure you are expecting me to tell you that only the privileged few get to see the test lab, CT scanner and CNC workshop in action but every year Canyon host their “Pure Cycling Festival” where Jo Public can get to see the workshops for themselves as well as a tour of the factory. I reckon that is pretty cool and if you are a bit of a geek like I am, it kicks the arse out of wandering around a museum or art gallery every day of the week. Moulding the future! Boom and indeed tisch! 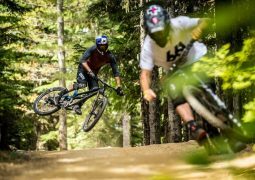 In part 2 of this feature – Sanny eats food and talks to more Canyon people while riding a bike.